May 14, 1973 – The Skylab orbital laboratory was launched from Kennedy Space Center. Skylab was launched unmanned from Space Launch Complex 39A on a modified Saturn V rocket. Skylab would be visited by three crews from 1973 to 1974. The Skylab orbital space station was damaged during the ascent, and much of the first manned mission to Skylab was used to repair the solar panels and deploy a canopy to keep the space station cool. That first manned mission lasted 28 days. On May 25, Skylab II (SL-2, the first of three manned mission to Skylab), was launched on a Saturn 1B from Space Launch Complex 39B. The Apollo capsule carried three astronauts to Skylab: Moonwalker and Skylab II commander Pete Conrad, Paul Weitz, and Joseph Kerwin. Since the umbilical lines of the Saturn 1B and Saturn V were the same down to the first stage, a “milkstool” was used to boost the rocket up to the umbilical lines on the pad (a pad originally designed and built only for Saturn V launches. After the final manned mission to Skylab (SL-4), there was only a single Saturn 1B rocket left (which was eventually used for Apollo-Soyuz Test Project). 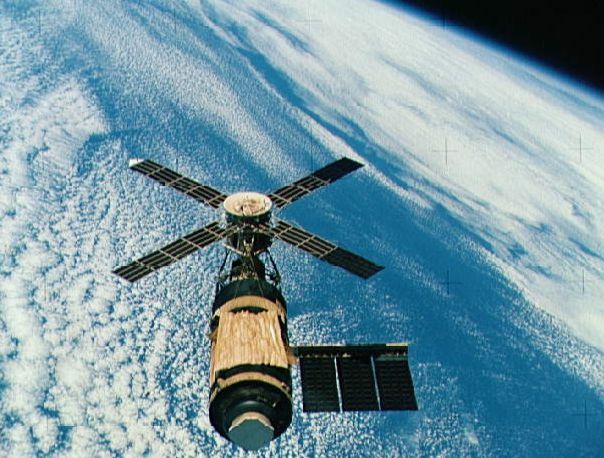 The unmanned Skylab orbital laboratory re-entered the Earth’s atmosphere and broke up on July 11, 1979. Confirmed pieces of Skylab made it to the ground and were found in Australia. 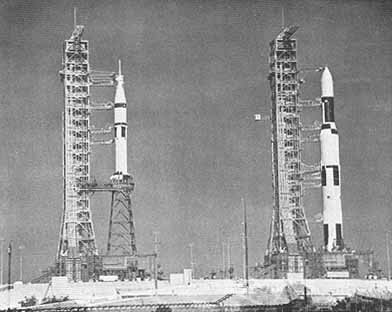 The launch of the Skylab orbital laboratory was the final launch of a Saturn V rocket. Some of my very favorite photos from space were taken during the Skylab missions, including these two from the first mission (both involving Pete Conrad). 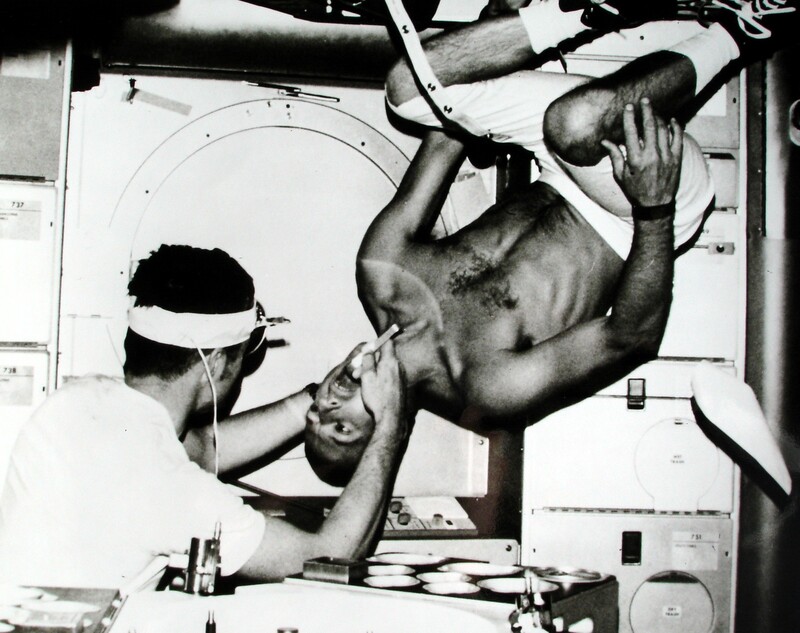 Notice that in space dental check-ups are much more practical. 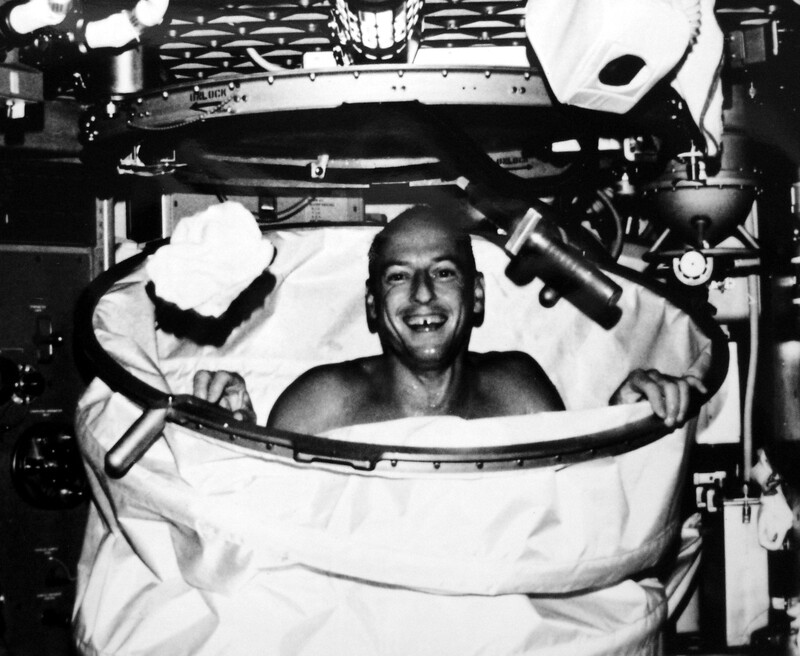 And take a look at the washcloth floating next to Pete Conrad next to him in the shower. This entry was posted in Leadership lessons from the Space Race, Space Race Memorabilia and tagged Kennedy Space Center, NASA, space race. Bookmark the permalink.